Making the decision to give up a pet can be difficult. Pet owners may surrender pets that they can no longer keep. People in this situation must call the shelter before bringing in the animal (s) so we can ensure that we have space to take the animal(s) at the time. It is a crime to drop and abandon animals outside the shelter unattended and the shelter does use video surveillance to monitor its shelter premises. When you call with a potential surrender, the staff will ask what you know about the pet’s health history and behaviour in order to best plan for intake. The shelter reserves the right to refuse entry to pets with behavioral issues. Aggressive behavioural issues may impact the safety of our staff and also the safety of potential adoptive families. 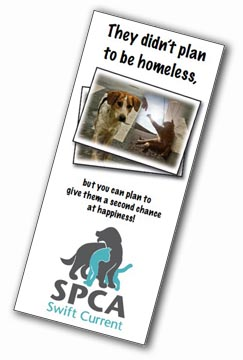 -If the shelter has space at the time, an appointment will be made for drop off. If space is not available the staff will add the pet to the waitlist and discuss other interim options with you; we will contact you as space becomes available. Generally we prefer that surrendered pets not be brought in through the main shelter door unless this has previously been discussed with shelter staff, as this may expose healthy pets to any condition or disease the incoming pets may have. Also, since surrendering can be a difficult time we can arrange a quieter time for you to do this. The shelter generally charges a surrender fee per pet to offset some of the many costs associated with the pet’s care and preparation for adoption. These costs may include basic vaccinations, vet-administered rabies vaccines, deworming medication, microchipping , and necessary medical treatment, spay/neuter and boarding fees.